KIDS CHOOSE from a prehistoric side where dinosaurs roam, volcanos erupt and tar pits bubble; then quick as a flip in present time where pleasant pastures are perfect for toy farm equipment and horses can gallop the fields. 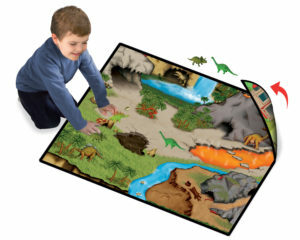 The Neat-Oh!® Dinosaur Prehistoric World 2-Sided Playmat is double the fun. 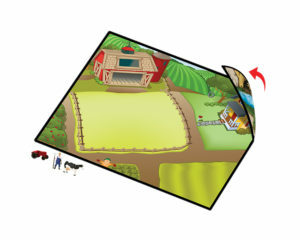 On one side, the Play Mat features a prehistoric world complete with volcanoes and tar pits and on the other side there is a barn and fields for farm play. 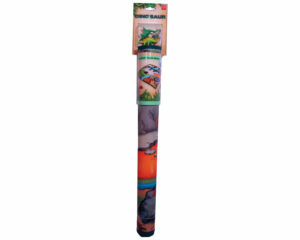 Neat-Oh!® Dinosaur Prehistoric World 2-Sided Playmat includes two dinosaurs and is the perfect size for travel. When it’s time to go, roll up or fold and stow away! Includes 2 dinosaurs. Have fun and decorate your room with all Neat-Oh!® ZipBin® Dinosaur products.